There are two main methods through which LEDs can produce white light. One method is to use red, green and blue diodes so that their combined output appears white to the human eye. However, the limitation of this approach is that it requires three types of LEDs, and heat dissipation becomes an issue when they are assembled into a chip. The other option, which offers improved efficacy and is preferred by the lighting industry, is to use blue LEDs and lenses with a yellow phosphor coating, where some of the blue light is shifted to yellow and the combination of both wavelengths appears white. Since phosphors play such an important role in LED lighting, any reduction in their production costs can contribute to making LED products more affordable. Advances in phosphor technology can be classified into two broad categories: those focusing on the materials themselves, and those focusing on their manufacturing processes. 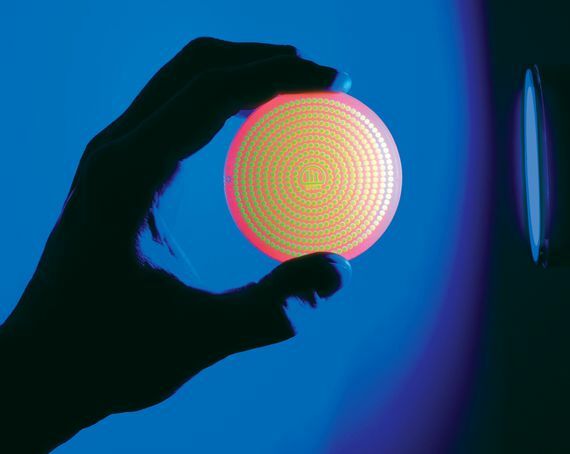 The main issue that increases the cost of phosphor coatings is that conventional LED chips have wiring and contacts on their surface, and direct deposition of the phosphor layer is not possible. Instead, it must be deposited on a lens above the chip. The “flip-chip” is an alternative architecture where the LED chip is flipped with respect to its normal orientation, and light is emitted from the bottom layer instead. This results in a surface that is completely free from wiring, contacts and other components, and it becomes possible to deposit phosphor layers directly, using a film made from either glass or a polymer. Researchers from the University of Leuven (Belgium) and the University of Strasbourg (France) have developed a new material that has the same effect as conventional phosphors in blue light, while offering a lower manufacturing cost and reduced toxicity. This technology uses silver clusters embedded in zeolites, which are naturally porous materials that can also be produced synthetically. Silver clusters can scatter light just like conventional phosphors, but their application in LED lighting had been limited due to instability: they tend to merge into larger crystals over time, losing their optical properties. However, when silver clusters are embedded in zeolites, this effect is prevented. In large-scale manufacturing, silver zeolites can achieve a lower cost than conventional phosphors, while offering an improved optical performance. This will translate into a higher luminous output for each dollar spent on LED lighting. LED technology represents the future of the lighting industry, and is growing faster than both renewable energy and electric vehicles, per Goldman Sachs Global Investment Research; LED products will account for over 95% of all lighting used by the year 2025, and luminous efficacy is expected to have doubled by then. As stated by KU Leuven and the University of Strasbourg, advances in phosphor coating technology will contribute greatly to LED lighting efficacy improvements and cost reductions.